Cut off the extreme tips and chop the rest of the stalks. Cook the stalks in boiling water to just cover until they go soft. In a blender, puree the stalks with their cooking water to make a thick stock. Add dry white wine and a small amount of salt, simmer over a low heat. Steam or blanch the tips in boiling water. Remove the tips with a slotted spoon and set aside. In a pan, melt half of the butter and cook the shallot until it turns soft. 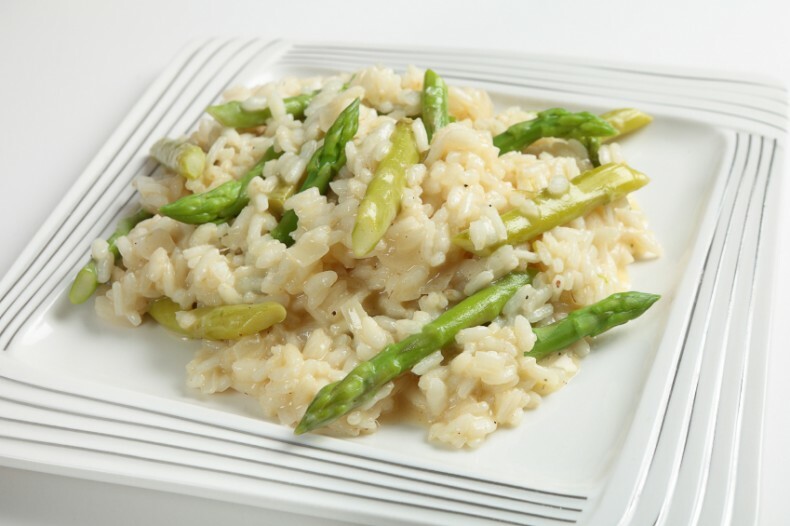 Add the rice to the pan and let it begin to absorb the butter before adding a ladle of the asparagus stock. Keep stirring until it is absorbed. Add another ladle of stock. Keep adding the stock, one ladle at a time, making certain not to drown the rice, until the rice is al dente (say 15-20 minutes). After the addition of the last ladle stir in the saved asparagus tips. Serve, sprinkling with black pepper and the grated parmesan cheese. Which size spears should I choose? Umm, a frequently asked question... It depends! Are you going to indulge just you and a "friend"? Definitely Large. Entertaining? Need a vegetable to accompany the main course? Then choose Medium, one bundle will be generous for 3 people. For quiches, salads etc, choose Small. We have already washed and trimmed, unlike other suppliers, all our asparagus is ready to use. As a general rule, asparagus is cooked when the tips are tender, but not soft to the point of a knife. Caution! Withycombe asparagus is very fresh so it will need less cooking. Lay the lightly salted asparagus flat in the top of a steamer over boiling water. Cover and steam for approx 6 to 8 minutes. Tie the asparagus in bundles, or leave the band on, and stand in 2 inches of lightly salted boiling water. Cover the tips with foil to catch the steam. This ensures that the stalks cook in water, but the delicate tips cook in steam. About 6 to 8 minutes. Arrange the spears lengthwise (tops in centre) in a baking dish and add 2 serving spoons of water. Cover, and microwave on HIGH for 3 minutes. Rotate the dish a half turn, then microwave for another 2 minutes. Allow to stand before serving. Lightly brush spears with olive oil, season with salt and pepper to taste. Grill with medium heat (turn once) for about 3 minutes to desired tenderness. Serve as an appetiser with cured meats.